Lunar Calendar 2019: What Date Is The Full Moon? We reveal everything you need to know about the four main phases of Moon in our Lunar calendar 2019. The Moon’s influence is unmissable which is why you must know the Full Moon dates 2019. Are you wondering when is the next Full Moon? Our Lunar calendar 2019 reveals what you need to know about the Moon cycles. If you want to know what is the current phase of the Moon, look no further! Moon calendar 2019 helps you track all the Lunar phases of 2019. 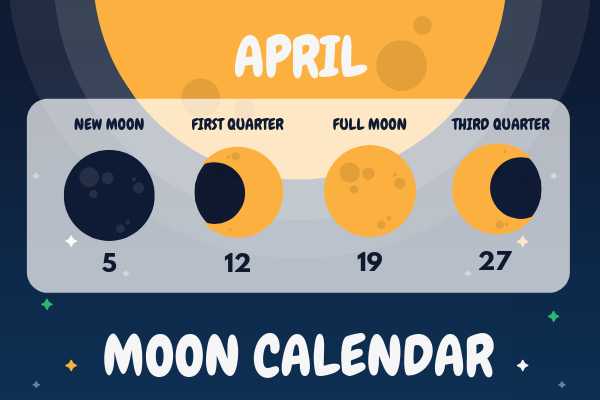 Our 2019 Lunar calendar is an easy way for you to find out the lunar phase for any given month. What is the Moon Phase today? With our 2019 Lunar calendar, you'll find dates for the Full Moon, New Moon, as well as the other lunar phases. See what phase the Moon is in today with our Lunar calendar 2019! How will the next Full Moon impact me? What are the names of the Moon phases? Why do we have phases of the Moon? Can there be a month with no Full Moon? The Full Moon of April 19, 2019 will feature in Libra. A Full Moon is Libra gives you the strength you need to focus on sharing as well as promoting peace and harmony. The Full Moon in Libra boosts intimacy and will bring you closer to your partner and your children. All of your relationships will benefit from the presence of the Full Moon in Libra. Be prepared for this event with our Full Moon superstitions and follow our Lunar calendar 2019 carefully. Your ascendant sign also influences your life events. Figure out your ascendant with our rising sign calculator. How will this Full Moon of April 19, 2019, affect us? The Full Moon is a time for enjoying the rewards of our hard work undertaken during the period of the New Moon. If you worked hard during the period of the New Moon, you can look forward to enjoying the fruits of your labor during the Full Moon that follows. Although, if you were inactive and lazy during the New Moon, then unfortunately the Full Moon will require you to reflect on your failures. April’s Full Moon will feature in Libra on April 19, 2019. The Full Moon in Libra will spark a very peaceful, harmonious and pleasant period. The Full Moon of April 19 will be helpful in uniting people and repairing broken or neglected relationships. The Full Moon of April 19 in Libra will also be linked to Uranus. Uranus gives the strength and determination needed to help people express their opinions. During the Full Moon period of April 19, Uranus will ensure the rewards of your hard work flow in. The presence of Jupiter will help boost your confidence and will give you a hand in overlooking other people’s negative opinions. You’ll feel a sense of satisfaction and pride during April’s Full Moon, you’ll also feel ready to take on the toughest of challenges. Pluto’s presence during the Full Moon of April 19, will aid you in figuring out the best ways for you to work towards achieving your goals. Don’t let anything stand in your way! When should you cut your hair in accordance with the Moon? Which phase is the Moon in today? The Moon has and will always be a subject of wonder and fascination, which is why we bring you our complete Lunar calendar 2019. The Full Moon is the best known lunar phase and now, thanks to our Moon calendar 2019, you never have to miss another one again! Everyone will be affected in one way or another by the New Moon as well as the Full Moon. The Full Moon of April 19, 2019 will affect certain zodiac signs more than others. The most affected zodiac signs by the Full Moon on April 19, 2019 will be Libra, Pisces, Capricorn, Cancer, Scorpio, Taurus Sagittarius and Aquarius. Discover the Full Moon effect on your star sign. Curious about the Full Moon and your horoscope sign? What Full Moon effects can you expect on April, 19? We reveal the Full Moon's influence on each zodiac sign. A revelation is in store for Aries people. Expect some good news at work. You'll find the solution you've been looking for. A reconciliation is around the corner. Time to get what you want. Look into your financial situation. Show people what you're made of. Opportunities are coming your way! You'll get to finish what you've started. You'll have to make sacrifices. New horizons will open to you. You'll learn to open your heart. The Full Moon is the lunar phase in which the face of the Moon appears fully illuminated. When the Moon and the Sun are on opposite sides of the Earth, we view the Moon as being full, hence why it's known as the Full Moon. The side facing Earth is completely lit up by the Sun and appears as a disk. The Full Moon occurs once roughly every month as shown in our Lunar calendar 2019. The New Moon occurs when the Sun and the Moon are on the same side of the Earth. During a New Moon, the face of the Moon that we see from Earth is not lit up by sunlight. From Earth we are unable to see the New Moon in the sky, unless there’s a solar eclipse, with the Moon positioned directly in front of the Sun. Waxing crescent Moon occurs between the lunar phases of the New Moon and the Full Moon. During this waxing lunar phase the Moon appears as a crescent meaning it’s less than half illuminated. Following this lunar phase, the Moon then waxes and grows bigger into what we know as a half-moon. The first half Moon following the New Moon is called the first quarter because the Moon is a quarter of the way though the lunar cycle phases. The waning gibbous Moon cycle appears after a Full Moon when the Moon is completely illuminated. The term waning means the Moon is getting smaller and gibbous refers to the shape of the lunar body. The waning gibbous Moon can be identified due to its semicircle shape. Moon phases have an effect on the oceans too, and the tides actually change in function with the Full Moon. Humans are 80% composed of water, which explains why the Moon has such strong effects on our bodies. 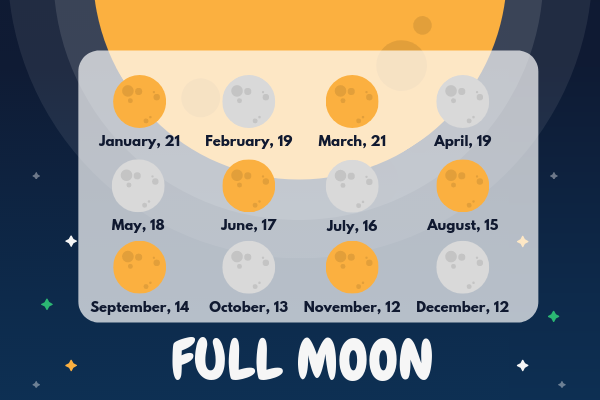 Track the Full Moon dates in our Moon calendar and never miss another lunar event again. The Moon is in the same direction as the Sun, yet the illuminated half is facing away from Earth. The portion that faces Earth is dark. A week after the New Moon, we can see a quarter of the Moon illuminated. Two weeks after the New Moon, we see the Full Moon. The Moon is half way through it’s cycle and the illuminated side faces Earth. Three weeks after the New Moon, we get to see half of the illuminated part of the Moon. The Moon has phases due to the fact that it orbits Earth, which in turn causes the part we see illuminated to change. When the Moon travels around the Sun, it's also lit up from varying angles by the Sun causing different lunar phases. The Moon orbits the Earth in 27.3 days and each Lunar phase cycle is 29.5 days. Moon phases including the New Moon, First Quarter, Full Moon and Last Quarter are produced once a month. A Blue Moon is a natural phenomenon in which 2 Full Moons appear in the same calendar month and have a blue appearance due to the dust and smoke particles in the atmosphere! Blue Moons are fairly rare, but are great to see. Facing moments of doubt? Contact one of our experts for some extra guidance! What is the link between the Moon and Astrology? Medium, Clairvoyants and Astrologers have relied on the Moon's position for hundreds of years to guide them in their predictions. The Moon's position at your time of birth reveals lots of priceless information about your personality. To find out more about the connection between the Moon and Astrology, check out your daily horoscope. Can there be a month without a Full Moon? The only month that could potentially not have a Full Moon is February and if this occurs, it will be in a leap-year when February only has 28 days. February is the shortest lunar month, so a Full Moon isn't guaranteed. Gardening with the help of the Moon.